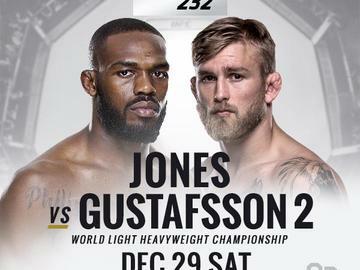 UFC 232: JONES vs GUSTAFSSON 2. The most anticipated clash in MMA history for the undisputed UFC title bout. Come watch UFC 229: McGregor vs Khabib on Clydesdale Bar & Lounge Pocatello Large 112" HD screen. * HUGE AFTERPARTY to Follow. * We will be giving away Door Prizes & MORE! Call us at (208) 233-1841 or message us to reserve your spot. Tag & invite friends.